Well, I guess it happens to everyone at some point, right? I got a message today from another creator saying she had received messages from lots of people alleging I copied her work. I’ve been in this situation before on the other side of things, when well-meaning people contacted me to tell me someone either copied or stole my work. Usually it turns out to be an overreaction, but I appreciate others looking out for creators. The item in question was the new Riyadh set at Illuminate. Apparently several people told the creator I’d copied her, so she reached out to me to clarify. She was very nice about it, though I think we were both a bit upset by the situation. I was certainly very embarrassed and freaking out a little, because I work very very hard on making my items and I know everyone else does as well. I respect the commitment and care it takes to create mesh. I am sad. I spent so so many hours working on this set, and it’s probably one of the creations I’m most proud of. I have not been making mesh very long, and my skills finally progressed to where I could make something I’d wanted to do since I started. I don’t know what to say other than I absolutely did not purposefully copy anyone. I’m sure I wouldn’t feel so crappy if I did. Before I begin a project, I scour online images to find references. 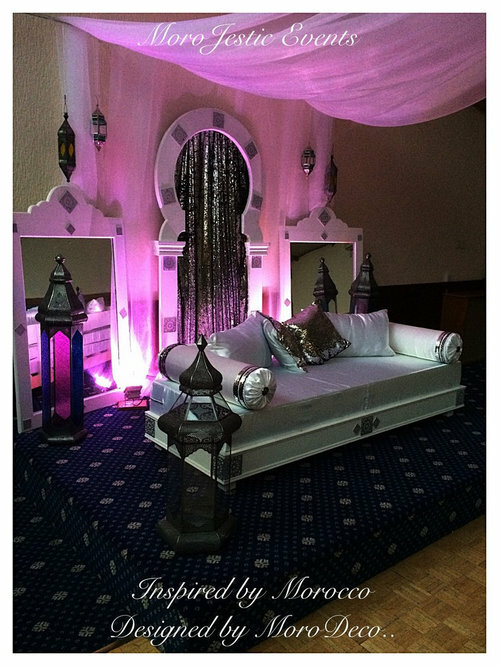 In this case, I used Moroccan daybeds and couches for influence. 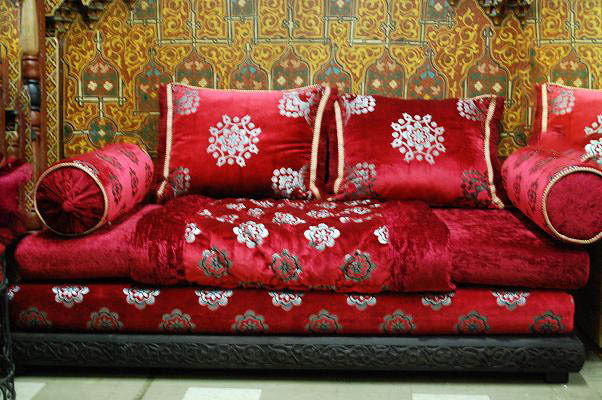 The main references I used for my living room set are from the MoroJestic collection, a Moroccan-styled furniture line. This one and this one are the main ones I looked at, along with this daybed from a separate collection. I used this and this for pillow inspiration, along with any number of ideas that come up searching “Moroccan pillow.” There are a lot more references I used, but you get the idea. I’m in the middle of making various Moroccan and Arabian-themed buildings and decor, because it is one of my favorite non-fantasy styles. The genre does have a distinctive look, and I think that’s part of where the problem lies. I made the canopy bed below for an upcoming event, and made the pillows so that I could use them on both pieces of furniture to tie them together. I’m sorry the couch looks similar to the other creator’s. I can’t deny that there are similarities, though again I feel a lot of it is due to the distinctive style of the genre. I feel sad. I can’t say that enough. I feel bad for the other creator too, because she had to go through this as well. It has to be said that she was incredibly nice about everything, and I double checked to make sure she didn’t have a bed like mine to prevent another round of gossip. I debated even saying anything, because it may well be that only a handful of people had these thoughts and ignoring it would let it dissipate into the SL mists. I think there are so many unscrupulous people around who would indeed copy others and not give a darn. But I’m really horrified this happened. I do think it’s good to check in with creators if you see something you think they should know about, but also realize that it is entirely possible that it’s a misunderstanding. The other creator said it best after we were done talking: SL is a huge place, but sometimes not big enough. I think that goes double for fantasy and niche creators, where source material has a more limited pool. Thank you for taking the time to read this, and I hope I didn’t come off as flippant or angry anywhere. This kind of thing hurts my heart, and I wanted to take a moment to defend my work. Fantasy Faire 2018 Is Here! Everyone knows and loves Fantasy Faire. Not only is it a very fun time with beautiful builds and tons of greats merchants, but it also is part of Relay For Life benefiting the American Cancer Society. This year, the proceeds will be going to a very specific project, the Kenyatta National Hospital. Please take a moment to read about this special mission here. The two items being released for Fantasy Faire are 100% donations going towards this awesome cause. Be sure to stop by the Faire and check out what so many designers have made to benefit the cause. You’re sure to find something you love, and know that you’ve done just a little part in helping some people who need it. The moon gate comes in gray or brown stone (both included). It’s 3 LI at about 4.75 m tall, but you can certainly make it smaller to decrease land impact and still be able to walk under it. It’s copy/mod and can be used in so many ways! The moon oracle also comes in gray and brown stone (both included). There are ten sit animations in it for all you seers, mystics, and seekers of future knowledge! The glowing waters slowly churn as you peer deep into the depths. Only 2 LI. The Fantasy Faire opens April 19th! Desert Winds Hit We Love RP! Several new releases for this round of We Love RP, opening on the 4th! This is the start of a themed series of releases that will consist of many different desert style buildings! The desert villa is an elegant home suitable for any desert-themed roleplay! It has a large main room with rustic support beams, and a smaller side bedroom/sitting room on the main level. There is also a small outdoor patio space under a texture change canopy (8 color options). Stairs lead up to a small second floor room with private terrace. There is a ladder to the roof for even more space to use and decorate! All together the build is 21 land impact. I also included the upper room separated from the build to use as small quarters surrounding the main build if you like. It’s 4 LI by itself, including ladder. The desert wall kit is a bold set of building items to create a custom wall or enclosure. There are three types of walls: Plain (with recesses that can be used to hold candles or other items), Bar (with decorative metal bars/windows), and Doorway types that can be used with or without included doors. The stately wooden double doors have metal studded surfaces and sleek ring pulls and are scripted to open in synchrony. The posts have a stylish onion dome topper that gives these walls a lot of character. Included a sample build so you can see how the pieces fit together. Each piece is 1 LI. The Villa rugs are the same mesh style as the Galaxis rugs, which quickly became a customer favorite! They’re relatively flat to make it easy to position furniture on top, but still have a few folds and imperfections to give them character. These are only 1 LI at a generous size, and come in two different color packs: rich or pastel. Each pack has 3 pattern options and 8 color options for each pattern, so it’s like 24 rugs in one! Available starting April 4th at We Love RP!